HAS DEPOSIT! Ziva is Our Precious Diva! 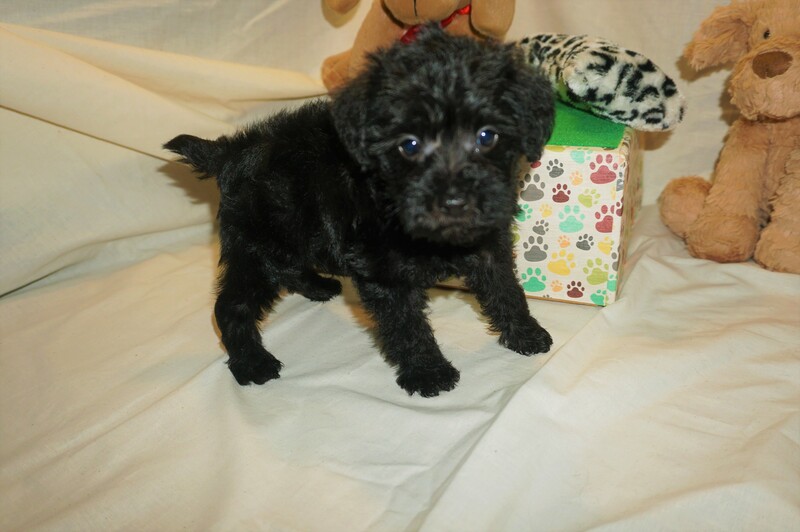 Gorgeous Black Female Schnoodle! Hello there are you looking at me? Well I’m Little Ziva! Grandma Woof Woof tells me I’m so beautiful and that I will find my fur-ever home really soon, Is it you? I have an awesome personality and will make the perfect addition to your family. I’m great with kids and other pets. Don’t worry though, I can’t wait to spoil you too! So call Grandma Woof Woof for me today because I can’t wait to be one of your new family members. Get the ball rolling and bring me home soon! Hey I’m Ziva and I’m one of three females in my litter of five and the only black one in my litter so if you love black you can’t help but fall in love with me at first glance, and especially after I share my puppy kisses with you. My litter name theme is names starting with Z after my mama, because her name is Ziggy. I have a gorgeous black shiny coat and the cutest docked tail. My mama Ziggy is a first time mommy. She is so sweet and loving and highly intelligent, Daddy Tori is a gorgeous red poodle so with these two highly intelligent parents I expect nothing less from myself so be prepared to start working with me so I can learn new things. And best of all is that I’m no shedding and hypo-allergenic. Just look at my face it is so cute it will melt your heart. My estimated adult weight is 8-12 lbs Birth weight is 5.9 oz Time can tell better as I get a little older. HAS DEPOSIT! 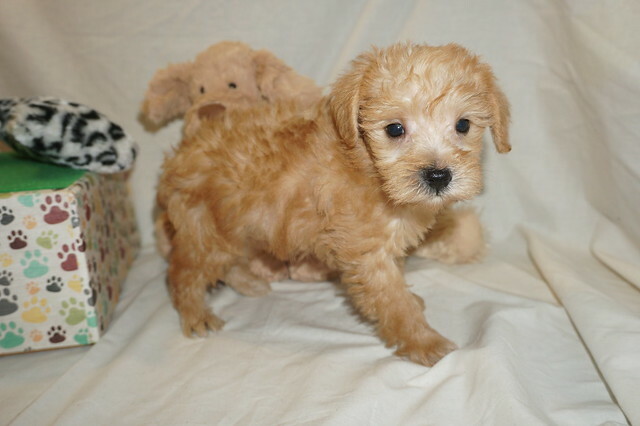 Zayda Small Red Female Schnoodle, She says, “Stop Right There You Found Me, I’m The One For You”! HAS DEPOSIT! CONGRATULATIONS TERRY FAMILY! 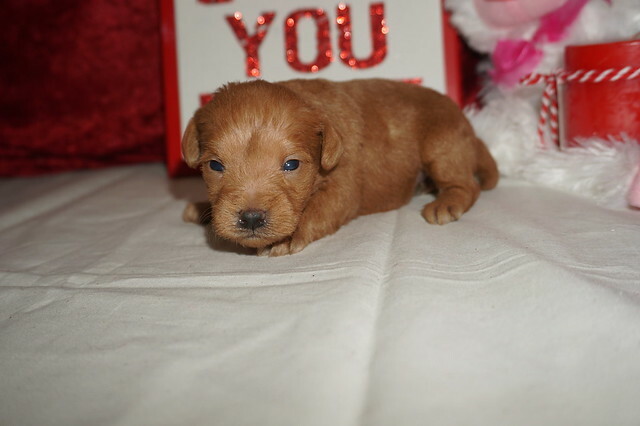 Hey I’m Zayda and I’m one of three females in my litter of five and I’m the only red female and the smallest of my litter. I pray you think I’m so adorable so you can’t help but fall in love with me at first glance. My litter name theme is names starting with Z after my mama, because her name is Ziggy. I’m a gorgeous dark red hair that will entice you to run your fingers through it, the cutest liver color nose and don’t forget I have the cutest docked tail ever that will will you giggle as I wag it in excitement of seeing you!. My mama Ziggy is a first time mommy. She is so sweet and loving and highly intelligent, Daddy Tori is a gorgeous red poodle so with these two highly intelligent parents I expect nothing less from myself so be prepared to start working with me so I can learn new things. And best of all is that I’m no shedding and hypo-allergenic. Just look at my face it is so cute it will melt your heart. My estimated adult weight is 6-8 lbs Birth weight is 3.8 oz Time can tell better as I get a little older. HAS DEPOSIT! 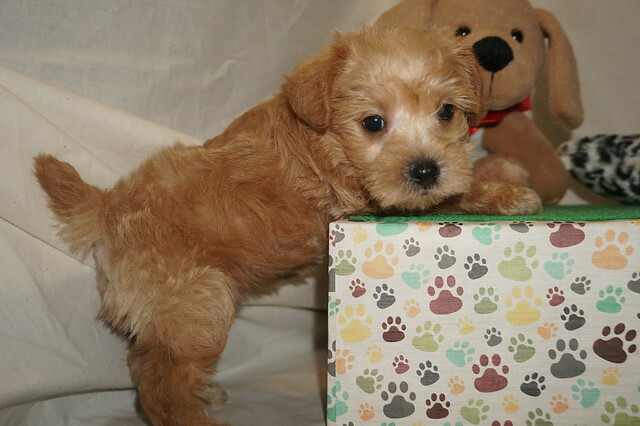 Zeus Red Apricot Male Schnoodle Wants To Be Your Chunky Monkey! Hello There let me introduce myself, I’m Zeus! I’m the cutest little chunky monkey you will ever meet. I promise to melt your heart the moment we meet. You will look at me and just want to snuggle, after all I’m as sweet as they come. I will be that perfect cuddle buddy you and I’ll always be the first to snuggle and cuddle for our movie night. Come on pick up the phone and Grandma Woof Woof and don’t let me the best little cuddle bug pass you by. I’m just sitting here waiting for you to make me (Zeus) your forever baby boy. Waiting on my new name and my new home is New York, NY. Hey I’m Zeus and I’m one of two males in my litter of five and I’m adorable so you can’t help but fall in love with me at first glance, and especially after I share my puppy kisses with you. My litter name theme is names starting with Z after my mama, because her name is Ziggy. I’m a gorgeous Red apricot color with the cutest docked tail. My mama Ziggy is a first time mommy. She is so sweet and loving and highly intelligent, Daddy Tori is a gorgeous red poodle so with these two highly intelligent parents I expect nothing less from myself so be prepared to start working with me so I can learn new things. And best of all is that I’m no shedding and hypo-allergenic. Just look at my face it is so cute it will melt your heart. My estimated adult weight is 8-12 lbs Birth weight is 5.8 oz Time can tell better as I get a little older. HAS DEPOSIT! 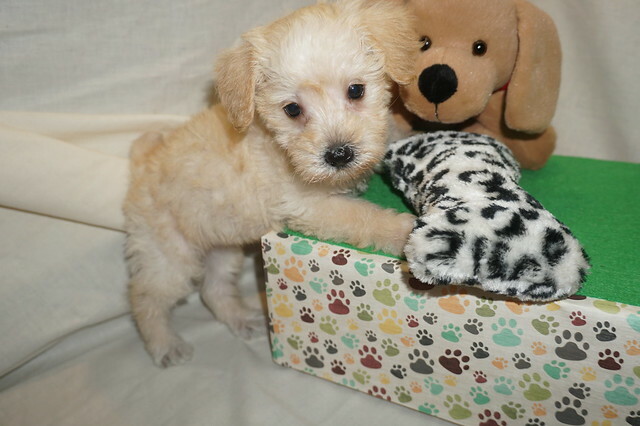 Zoi Cream Apricot Female Schnoodle, She says, “You Can Call Me Baby”! Keeping my new name and my new home is Jacksonville, FL. Hey I’m Zoi and I’m one of three females in my litter of five and I’m adorable so you can’t help but fall in love with me at first glance, and especially after I share my puppy kisses with you. My litter name theme is names starting with Z after my mama, because her name is Ziggy. I’m a gorgeous apricot cream color with the cutest docked tail. My mama Ziggy is a first time mommy. She is so sweet and loving and highly intelligent, Daddy Tori is a gorgeous red poodle so with these two highly intelligent parents I expect nothing less from myself so be prepared to start working with me so I can learn new things. And best of all is that I’m no shedding and hypo-allergenic. Just look at my face it is so cute it will melt your heart. My estimated adult weight is 8-12 lbs Birth weight is 5.9 oz Time can tell better as I get a little older. HAS DEPOSIT! 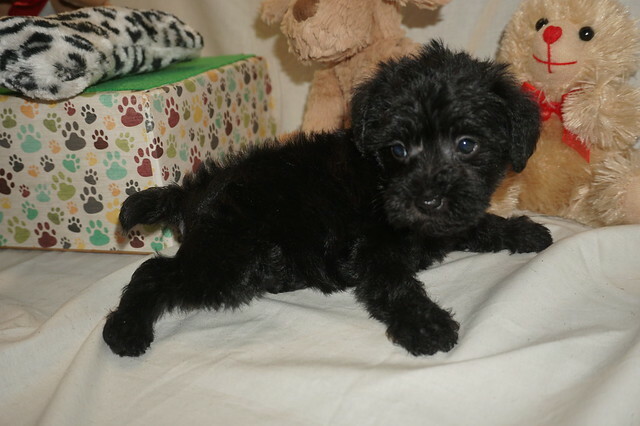 Zeke Red Apricot Male Schnoodle Comes Ready To Love You! Meet Zeke! He is such a sweet boy and would love to be your best friend for life. Imagine all the fun you’ll have with this cutie. You can take him for nice walks in the park or just cuddle with him on those lazy, rainy afternoons. Whether playing all day or relaxing on the couch, Zeke promises to be your most loving companion. Zeke will arrive to his new home pre-spoiled and ready to love you! Don’t miss out call Grandma Woof Woof today and say I want Zeke! Waiting on my new name and my new home is Ocala, FL. Hey I’m Zeke and I’m one of two males in my litter of five and I’m adorable so you can’t help but fall in love with me at first glance, and especially after I share my puppy kisses with you. My litter name theme is names starting with Z after my mama, because her name is Ziggy. I’m a gorgeous red apricot color with the cutest docked tail. My mama Ziggy is a first time mommy. She is so sweet and loving and highly intelligent, Daddy Tori is a gorgeous red poodle so with these two highly intelligent parents I expect nothing less from myself so be prepared to start working with me so I can learn new things. And best of all is that I’m no shedding and hypo-allergenic. Just look at my face it is so cute it will melt your heart. My estimated adult weight is 8-12 lbs Birth weight is 5.8 oz Time can tell better as I get a little older.